Arlene Ellen Ewalt, 87, of Casper, Wyoming formerly of Powell, WY, passed away Wednesday, March 27, 2019 at Shepherd of the Valley Healthcare Center in Casper. She was born on April 30, 1931 in Jud, ND to Arthur and Lena (Kalmbach) Podoll. Her father died when she was a young child and the family relocated to Powell, WY where her mom met and married her second dad, August Fetzer. Arlene attended 1st through 4th grade in Jud, ND and 5th through high school in Powell, WY. She married Kenneth Ewalt on December 16, 1951 in Powell and together they started their family in the Cody area. Arlene was a hard worker. As a youth she sorted beans at the Powell Bean Mill. In her working years she cleaned houses and laundered/ironed clothes for others. She had fond memories of working with her sister-in-law, Dorothy, at the Green Gables Inn in Cody, WY. She worked for the Powell School System, starting as a cafeteria cook and later on as a custodian. Following her retirement in 1989, she helped her husband, Kenneth, manage The Triangle Trailer Court in Powell. Arlene loved the Lord and greatly enjoyed singing with her sister, Sharon, in the church choir. Arlene's faith was very important to her. 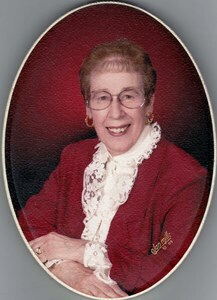 She was a life-long member of the Lutheran Church, attending in Cody, Powell and most recently in Casper. She was very proud to have been one of the charter members of the Christ the King Lutheran Church in Cody, WY. She had an unwavering faith in Jesus! She is survived by her children, Arbie (Deb) Ewalt of Casper, WY and Lorinda (Michael) Bessler of Shoshoni, WY; grandchildren, Dustin (Christina) Ewalt of Casper, WY, Desaray Alcorn of Riverton, WY and Mikeal Bessler of Shoshoni, WY; great grandson, Tanner Ewalt of Casper, WY; siblings, Verna McCaffrey of Gravette, AK, Delbert (Sandi) Fetzer of Powell, WY, and Sharon (Bill) Christensen of Billings, MT; sisters-in-law, Jessie Fetzer of Powell, WY, Dorothy Podoll of Billings, MT, JoAnne Ewalt, of Snyder, TX, and Evelyn (Marvin) Berghorst of Riverton, WY; brother-in-law, John Rowland of Riverton, WY; as well as many nieces, nephews and other relatives. She was preceded in death by her husband, Kenneth Ewalt; parents Arthur and Lena Podoll, and August Fetzer; and siblings, Floyd Podoll, Harold Fetzer, and Alice Connor. Arlene's family thanks the Staff of Garden Square Assisted Living and Shepherd of the Valley Healthcare Center of Casper, WY and her physicians for the loving care she received during her residence in Casper. A Memorial Service will be held Friday, April 12, 2019, 10:00 a.m. at the Immanuel Lutheran Church, 675 Avenue D, Powell, WY. Reception to follow at the church. Interment will be Friday, April 12, 2019 at 2:00 p.m. in Bull Creek Cemetery, Cody, WY. To share your memories of Arlene or leave a special condolence message for her family, please click the Share Memories button above. Add your memories to the guest book of Arlene Ewalt. I remember great card games. We played hearts and taught Arbie the game and he beat us all. We all enjoyed homemade cake and ice cream after cards. Rinda has all the favorite recipes and maybe she will share some. Arlene supervised us well at our homes and at the school where she worked! What a blessed life and family she shared with the CharleySheets family!